Review Palm's Treo 650 was undoubtedly the company's best smart phone release in the UK, and while the 750v offers only a couple important new features - Windows Mobile 5.0 and 3G connectivity - it's nonetheless a big step forward. But it's not the leap ahead that its predecessor was over the 600, and there are still some surprising omissions. 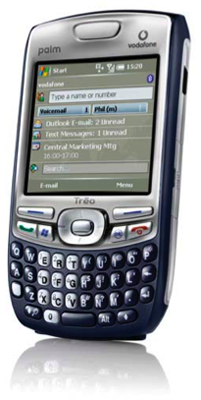 The 750v is clearly a member of the Treo family - Palm has tweaked the design, but there's nothing radically new here. Yes, the antenna stub's gone, which is a bonus. While not for me a deal-breaker, the antenna certainly was for many other potential European buyers. The corners of the phone are less pronounced, but the new model has a more angular look reminiscent of Vodafone's BlackBerries, particularly the 7100v. Palm has shaved a millimetre or so off the 650's dimensions - more if you include the 650's antenna - and 24g off its 178g weight, but the 750v counter-intuitively felt to me to be larger than the 650. The features on the back of the device are all there - speaker, camera, external aerial connector, battery compartment - just rearranged slightly. The 750v's dark blue and silver colour scheme is suitably sober and corporate-friendly. The blue area is tactile - it's vaguely rubbery - and feels good. The front's much the same as before too, with essentially the same array, this time tweaked for Windows Mobile rather than the Palm OS. The QWERTY microkeyboard is more 'smiley' than before, but I'm not convinced it's an improvement or a hindrance. The bigger call make and break buttons - positioned now next to Windows Mobile Today and OK keys - gets a thumbs up, though, as does the enlargement of the two keys above them, and their reallocation as soft-menu keys rather than application launch buttons. The big change is the display, reduced from the 650's 320 x 320 to a more Windows Media-friendly 240 x 240. It's still a 16-bit colour job, but the smaller resolution doesn't make itself felt, and the UI looks as good here as it does on other, larger-screened Windows Mobile devices. The screen's nice and bright, and you can turn the backlight down a fair way, to conserve battery power, without it getting too dark. Outdoors, in bright light, it's not so easy to read, but then the screens on few smart phone are in these conditions. The top of the device is still home to the very handy mute switch, but the SIM slot's now inside, under the battery. The 650's top-mounted infrared port can be found on the 750v's right side above the covered Mini SD slot - the cover also protects the 750v's reset switch. The left side of the phone is, once again, home to the volume control and a third button that, this time round, activates Windows Media Player when held. Palm's Multi-Connector can be found on the base next to the 2.5mm headset socket and microphone. Multi-Connector is well established now, so accessories shouldn't be a problem.